"The recent cars are very difficult to modify in terms of their onboard computer systems (ECU)". There are often cases where the aftermarket piggyback computer instructs the stock computer for more fuel delivery, but the stock ECU resists the command. This F-CON iS was developed for these new applications. The product now has a sleek see through cover so there is no need to hide the unit. 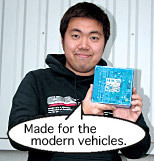 This product is available in Japan in March, 2006, for those enthusiasts who wish to tune their vehicles by ECU. HKS's new F-CON iS which premiered at the Tokyo Auto Salon is the new version of the existing F-CON SZ. The iS unit remains mostly similar to the SZ except that it processes information 25% faster. Like the SZ unit, it also comes with preprogrammed fuel and ignition maps for vehicles such as the Tourer, Skyline, Silvia, RX-7, and Lancer Evo when they are modified with a HKS air filter and/or a muffler. The new vehicles on the market today are very troublesome to perform ECU modifications since the stock computer overrides the commands given. The proper term used for this is "feedback revision". Basically, the stock ECU collects info from the sensors and the piggyback ECU revises and corrects them. With the new F-CON iS, ECU modifications can be done successfully. At any rate, this new product enables to override the strict stock ECU settings on the newer model vehicles. The F-CON SZ is able to do many functions that previous piggyback computers were unable to do. There are three methods to installing the iS unit to override the stock computer setting according to the model of the vehicle. - Connect the F-CON straight to the hard wires of the stock ECU. - Connect the F-CON with the optional harness to the OBD2 coupler. - Connect the F-CON by using the OSC computer. To know which method of installation fits for your vehicle, please inquire within at an authorized HKS dealer. Another key feature of this unit is that by connecting it to a navigation monitor, up to 18 different pieces of info can be displayed. The only thing required to connect is an audio video cable. Setting the Feedback Revision············· By installing the optional component "OSC", the feedback revision can be set on the newer types of vehicles on the market today. A/V Output Source·································· By connecting this unit to a GPS navigation monitor, 18 different pieces of information can be displayed. Ignition Revision on an AT Vehicle···· Prone to knocking during shifting, this function remaps the ignition curve. Aftermarket Air Flow Sensor················ An air flow sensor other than the stock unit can be revised with this function. NVCS Revision··········································· A function enabling the revision of the NVCS depending on the conditions of the engine revolution and water temperature on Nissans. AIC Function············································· A function enabling the addition of up to 2 extra injectors. EIDS Function··········································· Enables the control of the current sent to the air flow sensor after the throttle release on turbocharged vehicles. Immobilizer Function······························ Disables the engine to start when the setting passes the set parameters like when an air fuel controller is installed. Engine RPMs, velocity, air flow meter output voltage, throttle position, water temperature, intake air temperature, battery power, injector duration. Boost pressure, oil temperature, oil pressure, fuel pressure, exhaust decibels. OSC ignition timing, A/F correction value, A/F processing value By connecting the F-CON iS to a monitor via A/V cable, such info as the speed and the water temp can be displayed. A standard A/V cable can be purchased at any electronics store. By connecting the unit to HKS's interface unit, A/F knock amp, or an OSC, 18 different variables may be displayed on the monitor. For vehicles that do not require the use of the OSC, an optional communication cable can be used. This cable plugs right onto the OBD2 harness for easy use. Vehicles that cannot be programmed with just an connector cable may need the OSC computer in addition. Such cars like the Subaru GDB or the BPS may require one of these units. HKS is still currently researching which vehicles will require the OSC. The OSC can be purchased along with the F-CON iS as a set for roughly 113,400 yen. The clear blue case displays the inner workings of the computer and is beautiful enough to be displayed in or outside the car. The F-CON iS is able to reprogram the modern ECUs which are known to be very difficult to reprogram. Please inquire at one of our authorized HKS dealers to find out whether or not your vehicle will require the OSC unit. The F-CON iS performs its duties very effectively while sporting a cool looking design. We at HKS pondered which case design to go with, but at the end we settled with the coolest looking one! The iS is the same retail price as the F-CON SZ, but with more efficiency!